- The Grande Halle, which has become a multipurpose space for shows, with the magnificent Fontaine-aux-Lions-de-Nubie just outside. - The City of Science and Industry, one of the largest European Science museums, which hosts many exhibitions and conferences and a thousand activities popularizing science and technology in a fun way. 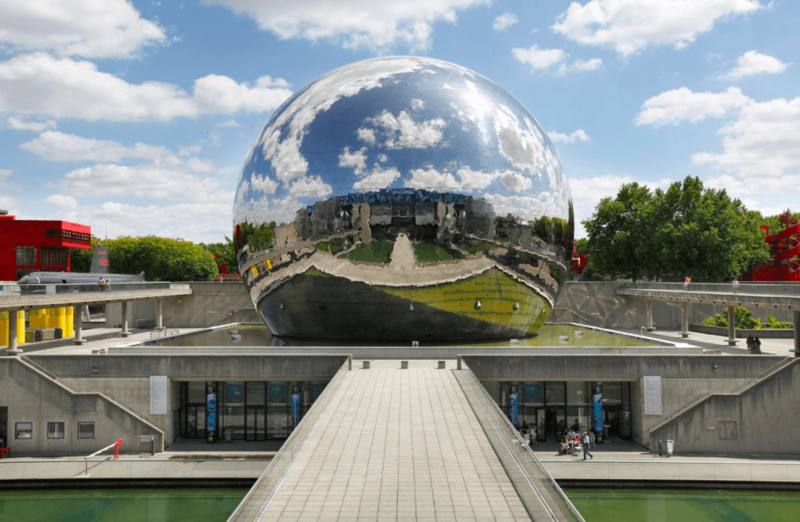 - The Geode, a shimmering sphere of stainless steel 36 meters in diameter, housing an exceptional cinema. -The Cité de la Musique -built by the architect Christian de Portzamparc- and the Philharmonie de Paris -built by the architect Jean Nouvel- featuring 450 concerts and 3 major exhibitions a year. The roof of the Philharmonie offers, moreover, a superb panoramic view on the whole park but also on Paris beyond. A little further in the park, the mythical Zenith is one of the most important concert halls in Paris, where the biggest international groups have played. Other places such as Trabendo or Le Cabaret Sauvage complete this broad musical program and participate in the rich offer of festivals and events in the Park and Halle de la Villette.